If dives are your thing and you ever find yourself near the Forest Hills T stop, you might want to check out the Jeanie Johnston. The lighting is low, there are TVs everywhere, the Guinness is certainly well-poured, and the trivia host was doling out Halloween candy. Spying nachos on the menu, we were pleasantly surprised to see a few unconventional toppings, and went for steak and mushrooms in hopes of a novel experience. Appearance: (4) Lettuce! Our sworn enemy! Just when we thought that we had escaped your clutches, you taunt us yet again!! And you aren’t even green enough to make these appealing! Quality of Ingredients: (4) Well, the steak bits were good…and that’s about all. Mushrooms were thin, dry and sparse. Cheese was congealed. Chips, salsa, jalapenos, etc. were utterly forgettable. 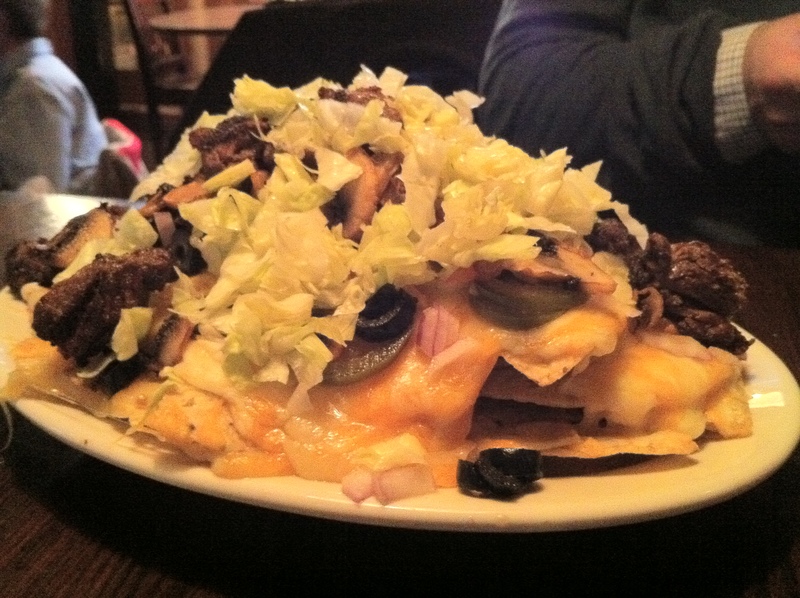 Distribution of Toppings: (4) Piled too high on a small plate, with a single layer of cheese on top. Once we had picked off the good stuff the situation got dire, but we persevered out of hunger. 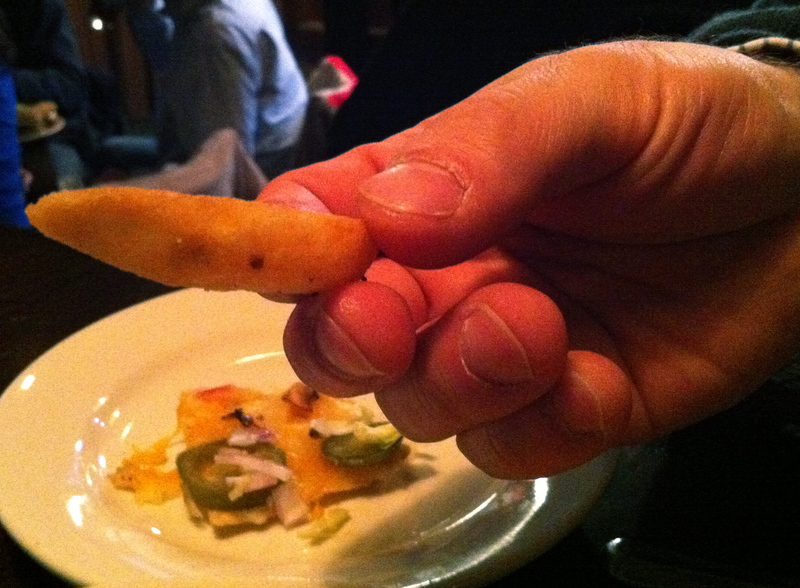 Our thoroughness lead us to an extra added bonus item: a lone french fry nestled deep in the mountain of chips. After the steak, splitting this fry was one of the highlights of these nachos. Price: (7) Where many other restaurants would probably try to get away with charging an arm and a leg for steak, it was refreshing to see only a $2 .50markup, the same as chicken or chili. Mushrooms were another $1.50 (and definitely not worth it). Overall: 19/40. To cite Wikipedia: “Put lipstick on a pig: a rhetorical expression, used to convey the message that making superficial or cosmetic changes is a futile attempt to disguise the true nature of a product.” These nachos immediately brought this phrase to mind, as they were nothing but sub-par nachos with a little fancy dressing. To be fair, this place is a dive and the nachos weren’t pretending to be much more than they are, but the steak (and bonus french fry) was the only thing that made them worth the time and effort. Just skip right to the good stuff and order some steak tips, maybe with a side of chips if you’re really jonesing for ‘chos.